By using the Connect to Office commands, you can conveniently access commonly used libraries from a Microsoft Office program. The Connect to Office commands are: Add to SharePoint sites, Remove from SharePoint sites, and Manage SharePoint sites. These commands help you conveniently interact with Office programs (Access, Excel, OneNote, Outlook, PowerPoint, Project, Publisher, Visio, and Word) and their corresponding file formats that may be stored in a library. 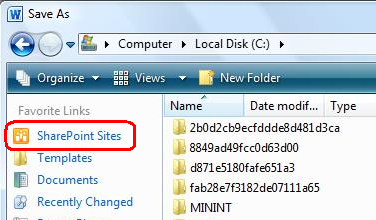 For example, after you use the Add to SharePoint sites command, a shortcut to the library is created in the SharePoint Sites folder of the favorites list in the Office Save Asand Open dialog boxes. Note: Word 2010, Excel 2010 and PowerPoint 2010 also keep a link to the SharePoint site under Recent Places in the Backstage view. Navigate to the site containing the library for which you want to connect to Office. Click the name of the library on the Quick Launch, or click Site Actions, click View All Site Content, and then in the Libraries section, click the name of the library. Note: A SharePoint site can be significantly modified in appearance and navigation. If you cannot locate an option, such as a command, button, or link, contact your administrator. On the Library tab, in the Connect & Export group, click the arrow next to Connect to Office. Click Add to SharePoint sites. A “Library added” message is displayed, indicating that the current SharePoint site has been added to the shortcut bar of the Office Save As and Open dialog boxes. Click Remove from SharePoint sites. A “Library removed” message is displayed, indicating that the current SharePoint site has been deleted from the shortcut bar of the Office Save As and Open dialog boxes. The QuickLinks page (http://my/_layouts/MyQuickLinks.aspx) of you’re my site is displayed so that you can modify the SharePoint Sites links displayed on the shortcut bar of the Office Save As and Open dialog boxes.